Opening party is 6 p.m. Friday at 3116 Warsaw Ave.
Take a tour through the Price Hill story gallery in the video player above. 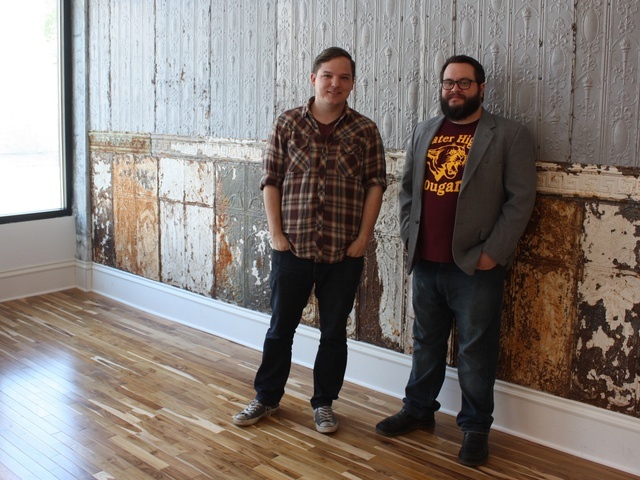 CINCINNATI -- Community-building initiative Cincy Stories captured lightning in a bottle last summer with an unusual story gallery in Walnut Hills , and now the duo responsible hopes to avoid the sophomore slump as they expand into Price Hill. Part art gallery, part living room and part coffeehouse, Cincy Stories is launching its Street Stories hub for all three Price Hill neighborhoods with an opening party from 6 to 10 p.m. Friday at 3116 Warsaw Ave.
They’ll have free drinks and food from local restaurants, live music and the opportunity for attendees to help preserve a history of the neighborhood by recording their stories in a specially built booth outfitted with a camera and iPad. Price Hill is a neighborhood in flux as more Spanish-speaking immigrants continue to settle there. As Braley and Cincy Stories Creative Director Chris Ashwell crisscross the neighborhood to build relationships with business owners and community members, they’ve already noticed the friction between long-time residents and newcomers. Cincy Stories is there to listen and produce short documentary films and photo essays for their award-winning gallery and website, but that’s not all. They want to take “actionable steps” and connect residents with community leaders so they can improve the neighborhood together. One memorable story shared in Walnut Hills came from former professional baseball player George Smith, whose dreams were dashed by a car crash the day he was to try out for the major leagues. Video Archive owner Jacob Trevino knew he wanted to help as soon as he watched Jones’ story. Together, they brought youth baseball back to Walnut Hills after a 30-year absence. Watch Smith's story in the video player below. Braley (left) and Ashwell at their Walnut Hills story gallery. Every Friday evening in July, Cincy Stories will host gallery parties that they hope will break down walls between different segments of Price Hill’s population. That’s exactly what happened at a gallery party last summer in Walnut Hills, Braley said. In walked a guy named Max who looked “a little bit rough,” sporting a white tank top, cornrows and face tattoos. He sat sullenly in the corner, munching on some food and listening, not at all looking happy to be there as attendees discussed “trivial” times they were accused of something they didn’t do. After a while, Max spoke up, sharing how he spent nine months in prison for a murder he didn’t commit before police realized the bullet didn’t match his gun. The diversity of Price Hill means Cincy Stories will lean on its partner Price Hill Will to connect with community leaders and find more allies like Max, particularly among the Hispanic population. They’re on a limited time frame, though, as the Wegman Company is donating the story gallery space only through November. The pair plans to then take Cincy Stories into another, yet-to-be-decided part of the city, eventually reaching all 52 of the Queen City’s neighborhoods. As Cincy Stories combed Walnut Hills’ streets last summer to find the right subjects for their films, Braley realized they needed help. “It’s really just a two-man operation here,” Braley said. “And one of those men doesn’t know anything about video!” Ashwell interrupted, laughing. Taking on five interns from the University of Cincinnati’s E-Media program in January enabled them to cover more ground while also teaching freshman through senior students how to use video equipment and connect with their community. Cincy Stories’ work in Walnut Hills was recently nominated for an Ohio Valley regional Emmy for public/current/community affairs program alongside two WCPO shows and one from WLEX, the NBC station in Lexington, Kentucky. Cincy Stories also nabbed the best local film prize at the ReelAbilities Film Festival in March . Ashwell sees his nonprofit newcomer going up against television stations with decades of experience as a bellwether for new media, predicting more online-only organizations will earn nominations in the coming years. The recognition from their Walnut Hills success earned Cincy Stories funding for their Price Hill gallery from the Haile/U.S. Bank Foundation , LISC and ArtsWave . However, whether the story gallery proves as successful on Cincinnati’s west side will depend on the community. Keep tabs on Cincy Stories’ progress through Price Hill on their Street Stories website here .